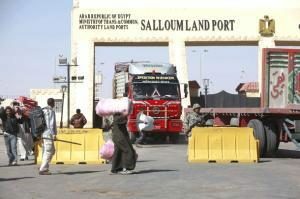 Interim Prime Minister Abdullah Al-Thinni has issued a decree saying medical supplies may arrive only by air and sea, but not by land. Ironically two of the airports listed as being allowed to bring in medical supplies – Tripoli International and Sebha – are not functioning. Another, Misrata, is not under his control. The same applies for the maritime ports of Tripoli, Khoms and Misrata. Tripoli’s Mitiga Airport, which is open but not under his control, was not mentioned. However, the decree includes the of Benina, Tobruk and Labraq airports, and Benghazi and Tobruk seaports, all of which are under his authority. However, Tobruk port was ordered to close in October by Khalifa Hafter and shipping diverted to Benghazi, although this has been somewhat relaxed since then. As part of the decree, Thinni has also restructured the eastern government’s medical supply authority, appointing a new board of directors headed by Salam Ojali. The authority is to be headquartered in Benghazi. No reason, though, has been given for the restructuring or why imports of medicines by land are being stopped. Thinni has meanwhile also replaced his undersecretary at the education ministry. Dr Salim Ali Mohamed Al-Hasiya will take over from Dr Aqoub Abdullah Aqoub, who had been in the role since 2016.